“The Americans and Mexicans very much want to try and get things done by Friday (Aug. 31) and we’re seeing if we can get to the right place by Friday, but as I’ve said all along it has to be the right deal for Canada and that’s what we are staying firm on,” Trudeau told reporters Aug. 21 in Kapuskasing, Ontario. Earlier Aug. 29, Canadian Foreign Minister Chrystia Freeland also expressed optimism, but said much work remained to be done to iron out the details. 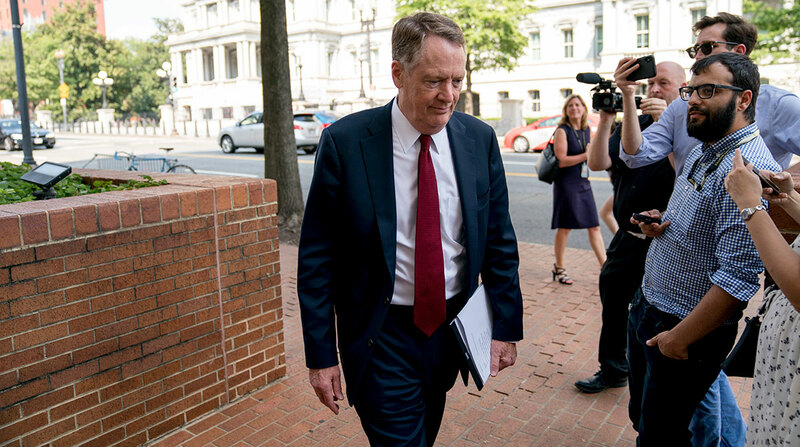 “There are some important things that we believe we have accomplished together with the U.S. and thanks to some significant compromises Mexico was prepared to make to support Canadian workers,” Freeland told reporters Aug. 29 in Washington after morning meetings with U.S. Trade Representative Robert Lighthizer. “When it comes to specific issues, we have a huge amount of work to do this week at the ministerial level and also the officials are really grinding through extensively,” she said. Canada’s dairy market is a focal point for negotiations, a U.S. official familiar with the negotiations said. Trump has repeatedly deemed Canadian tariffs on some dairy products as unfair for U.S. producers. Trudeau restated his position of defending the “supply-management” system that controls production of some Canadian farm products like dairy. Freeland said the U.S. and Canada agreed to not negotiate the unresolved details publicly. The U.S. is pressuring Canada to strike a deal by Aug. 31, which is when Trump’s administration plans to inform Congress that he intends to sign a new trade pact with Mexico in 90 days that would replace NAFTA. This week’s showdown has Canada under the gun to either strike a deal both can live with, cave to Trump’s pressure tactics or dig in and see what the U.S. will do.